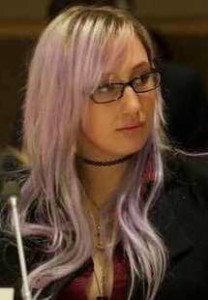 Zoë Quinn is an award-winning writer, comedian, game developer, and activist living in Los Angeles. She’s worked on dozens of independent games with a focus on exploring unconventional subjects ranging from depression to Gary Busey’s face. After facing severe harassment online, she started the crisis hotline and advocacy organization Crash Override, which helps others facing abuse. Her writing has appeared in multiple books and publications like Vice and Cracked. She has testified before Congress, the United Nations, spoken at numerous conferences like XOXO and SXSW, and has consulted with most major tech companies including Twitter and Google about how to make the Internet safer. When not fleeing a mob of anonymous harassers intent on destroying her life, she enjoys firespinning, riding her Harley, and building robots. Her memoir will be published in August 2016 by Simon and Schuster, and is soon to be a major motion picture produced by Amy Pascal.